Many state legislatures are now in session. A major issue that state lawmakers may currently face is whether to conform their state income tax systems to all the changes included in the Tax Cuts and Jobs Act (TCJA). Some states are considering or have adopted legislation to address the following key provisions of the new tax law. The media has given a lot of attention to certain provisions in the TCJA, such as the new limit on federal income tax itemized deductions for personal state and local taxes (SALT). For 2018 through 2025, the maximum deduction for the combined total of state and local income and property taxes is $10,000, or $5,000 for married people who elect to file separately. This new federal limit has put pressure on some states to reduce residents’ state income tax burdens or find ways to work around the rules. Bigger standard deductions. 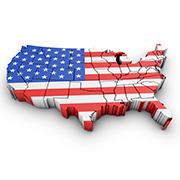 Many states base the state taxable income of individual taxpayers on federal taxable income. The TCJA almost doubled the federal standard deductions, causing federal taxable income to decrease for many taxpayers. Elimination of itemized deduction phaseout rule. Under prior law, up to 80% of the most popular federal itemized deductions — for mortgage interest, state and local taxes, and charitable donations — could be phased out for high-income taxpayers. If state taxable income is based on federal taxable income, this phaseout rule increased state taxable income and thereby created more tax revenue for the state. For 2018 through 2015, the TCJA eliminates the itemized deduction phaseout rule. Higher gift and estate tax exemption. For 2018 through 2025, the TCJA essentially doubles the unified federal gift and estate tax exemption. For 2018, the exemption is a whopping $11.18 million or effectively $22.36 million for a married couple. Several states and the District of Columbia tie their state death tax exemptions to the federal exemption. Liberalized rule for Section 529 plans. The TCJA liberalizes the Sec. 529 plan rules to allow federal-income-tax-free withdrawals of up to $10,000 a year to cover tuition at a public, private, or religious elementary or secondary school. This change is permanent, for qualifying withdrawals made after December 31, 2017. Deduction for pass-through business income. For 2018 through 2025, the TCJA allows individual taxpayers to claim a deduction for up to 20% of qualified business income (QBI) from so-called “pass-through” businesses. This includes sole proprietorships, partnerships, S corporations and limited liability companies (LLCs) treated as sole proprietorships or partnerships for tax purposes. Limitations apply at higher income levels. First-year expensing and depreciation for business assets. Under the TCJA, for qualifying property placed in service in tax years beginning after December 31, 2017, the maximum Section 179 deduction is increased to $1 million (up from $510,000 for tax years beginning in 2017), with inflation adjustments after 2018. Under the TCJA, 100% first-year bonus depreciation is also allowed for qualified property generally placed in service between September 28, 2017, and December 31, 2022. Bonus depreciation is now allowed for both new and used qualifying property. Elimination of personal and dependent exemption deductions. For 2018 through 2025, the TCJA eliminates exemption deductions. Quite a few states are affected by this change, because the number of exemptions they allow a taxpayer to claim for state income tax purposes is tied to the number of exemptions claimed on the federal return. New limits on business interest deductions. Under the TCJA, affected corporate and noncorporate businesses generally can’t deduct interest expense in excess of 30% of “adjusted taxable income,” starting with tax years beginning after December 31, 2017. For tax years beginning in 2018 through 2021, adjusted taxable income is calculated by adding back allowable deductions for depreciation, amortization and depletion. After that, these amounts aren’t added back in calculating adjusted taxable income. Business interest expense that’s disallowed under this limitation is treated as business interest arising in the following taxable year. Amounts that can’t be deducted in the current year can generally be carried forward indefinitely. Small and medium-size businesses and certain real estate and farming ventures are exempt from this anti-taxpayer change. Reduced or eliminated business deductions for business meals and entertainment. Under the TCJA, deductions for most business-related entertainment expenses are disallowed for amounts paid or incurred after December 31, 2017. Meal expenses incurred while traveling on business are still 50% deductible, but the 50% disallowance rule now also applies to meals provided via an on-premises cafeteria or otherwise on the employer’s premises for the convenience of the employer. After 2025, the cost of meals provided through an on-premises cafeteria or otherwise on the employer’s premises will be nondeductible. Eliminated deductions for certain employee fringe benefits.The TCJA disallows employer deductions for the cost of providing commuting transportation to an employee (such as hiring a car service), unless the transportation is necessary for the employee’s safety. The law also eliminates employer deductions for the cost of providing qualified employee transportation fringe benefits (for example, parking, mass transit passes and van pooling). As these examples show, state legislatures have plenty of tax conformity issues to consider this year. Both individual taxpayers and businesses will be affected by tax conformity outcomes. Your tax advisor is atop the latest developments and, as your state tackles these issues, can help determine how you, your family and your business will be affected. In many states, the calculation of state taxable income for individual taxpayers starts with their federal adjusted gross income (AGI). To Adjust or Not to Adjust? From there, states may allow their own exemptions and deductions. They also may mandate other adjustments to arrive at state taxable income. However, some states conform more closely by mirroring federal exemptions and deductions all the way to the state taxable income amount. How to React to Changes? States also have different procedures for reacting to federal tax law changes. Some automatically conform to all federal changes unless the state legislature specifically decouples from certain changes. Other states follow the federal rules that are in effect for a particular year and must adopt any changes to those rules. However, these approaches to conformity are generalizations, because no two states conform (or decouple) in exactly the same way. For example, a few states allow you to deduct your federal income tax payments in calculating your state taxable income, but most don’t. Some states require you to add back any federal itemized deduction for state income taxes, but others don’t. Some states give you a credit for a percentage of your state and local property tax bills, but most don’t. Some states adjust their tax brackets every year to conform to the federal tax bracket inflation adjustments, but some don’t. The differences go on and on. Conformity issues also exist for business state income tax returns. For example, some states haven’t allowed previous increases to the federal Section 179 first-year depreciation allowance. Differences in tax rules across state lines add complexity to filing personal and business tax returns, especially for individuals and businesses that earn income in more than one state or move during a tax year.